Our specialist delivery service caters for those awkward or strange deliveries a normal courier won’t touch! We can cater for most deliveries including those awkward sized ones! Whatever your requirements are, no matter how different or difficult they may be, no matter what the size, shape, weight or value it’s worth talking to us to see if we have a solution for you. If you look in the delicate goods section you will see from the main photo that we are no strangers to interesting and demanding loads! Please do not hesitate to ask our controllers for advice or assistance with any logistical problems you have. We have utilised the services of Invicta Couriers for many years, to support our logistics requirements both locally, nationally and on occasion to other European destinations. We have found Invicta Couriers to be a reliable and flexible Company who deliver the level of service we require, often at very short notice. This is to conform that we at Invicta Produce Ltd have been using Invicta Couriers for a number of years and have always found them able to meet our requirements, together with being professional in their approach to business, reliable, competitively priced and always putting their customer first, therefore we have no problem in recommending them. I personally have also known and used the company over a period of some ten years while being employed in a previous company, again as with the same recommendation applies. i confirm that I have dealt with Invicta Couriers since 2004, during which time they have provided our company with excellent support in transporting our water samples from our offices in Folkstone to our laboratories in Watford and Staines. 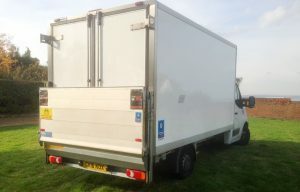 One of the reasons we initially approached Invicta was due to the fact that they could offer temperature controlled vehicles with constant monitoring, to ensure that our strict guidelines are adhered to. One of the reasons we have remained with Invicta is based in the good working relationship and trust that has developed. The nature of our business means that we can require sample transportation during unsociable hours and very often, at very short notice. I’m delighted to say that Invicta Couriers have always been able to accommodate our needs. I can confidently recommend Invicta Couriers as providers of a flexible and reliable service. We are a special bakery with a production site in Whitstable. Invicta Couriers have been crucial in the success of our company. We have been working with Invicta for 8 years now – for 2 years Invicta Couriers ran an overnight import service from Germany before we set up our own production in Whitstable. Invicta not only handled the import side, they also handled the second leg of the journey which was to deliver it to our customers in London. Invicta had to customise their vans for the import service. Invicta deliver our bread on two nights a week to around 25 shops in London. Invicta Couriers hold the keys to a large number of shops for this purpose. They also handle local courier work for us. In all these years I have never been let down by this company, their controllers and drivers are always friendly, courteous and flexible. Whenever I needed to call their 24-hour telephone line it has always been manned and even if something has gone wrong, they put it right immediately. We did try a number of courier services before we settled with Invicta. it gives me great pleasure to recommend Invicta Couriers to any business. It is quite rare to get such excellent service from any company. Bakkavor Group is a leading international food manufacturing company specialising in freshly prepared foods and produce. The group operates 55 factories and employs around 20,000 people in eight countries with pro-forma turnover in 2006 of over £1 billion. The company have five core values that underpin the way we do business, one of which is, customer care: We are committed to supplying outstanding service, quality and value, never forgetting that our relationship with our customers is pivotal to our success. Invicta Couriers have helped us to achieve this in conjunction with our team at Tilmanstone. They provide transport solutions for the effective distribution of samples to our customers and internal buying teams. On many occasions that has been at short notice and often outside traditional working hours. We have been working with Invicta’s for a number of years now and would consider their flexible approach and professional manner a credit to their management team. It is on this basis that I would not hesitate to recommend their services to any business.